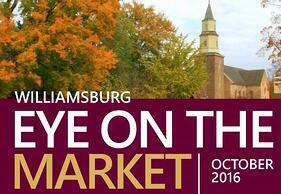 The average number of days on market in the greater Williamsburg are housing market (23185, 23188, 23168) is 55 days. That means that homes are selling in less than two months! Current inventory of available homes on the market is relatively low, which translates to a great time to sell. *Statistics are from the Williamsburg Multiple Listing Service, and are based on January – September, and run date October 15th, 2016. If you’re a seller who has been wondering if it might finally be time to sell, email us at concierge@lizmoore.com, or click below, and we can prepare a complimentary analysis of market value for you – you just may be pleasantly surprised.